This is the fifth of five companion pages on Journal Jumpstarts. If you haven't had a chance to see the first page, it's located here. As I mentioned before, whether it's applying oil to a canvas, shooting billiards, or illustrating books--the more we do it, the better we get at it. And writing, especially with kids, is no different. 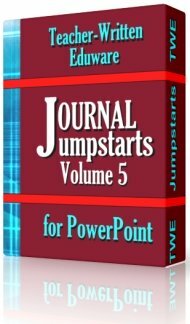 What follows on this page is an introduction to a product called Journal Jumpstarts, Volume 5. It offers writing prompts 81-100 that are already available free of charge on the Journal Writing Prompts page. Rather than a simple listing of prompts, Journal Jumpstarts Volume 5 is a complete PowerPoint package designed to intrigue and to motivate students to exercise their writing muscles--and in the process, to get that much-needed practice. Journal Jumpstarts Volume 5 also saves you the time and effort of scrawling out the writing prompt of the day on your whiteboard. Bonus: Any or all of the 21 high-quality animations included in this package may be used in your own PowerPoint presentations. Just choose the ones you want to use and place them anywhere you wish! Free and full versions are both available. More about that in just a moment. This PowerPoint presentation is a collection of 20 writing prompts for language arts students, grades 5-9. These high-interest prompts will provide spontaneous practice for kids to sharpen their writing skills as they describe, explain, persuade, and narrate. 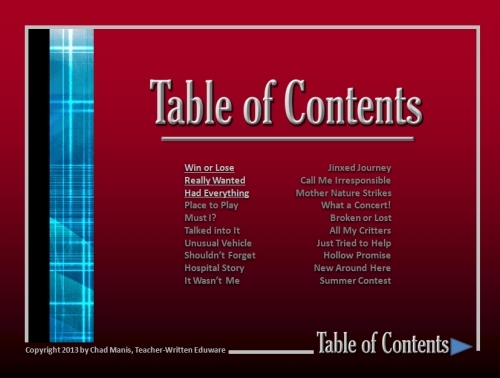 The Table of Contents (shown below) contains clickable links to assist in accessing/tracking the prompts. As a result, prompts may be displayed in any order required. a looping, presentation-wide animation along the left side of the slide. a unique, featured, looping animation, selected to "illustrate" the prompt itself. a link back to the Table of Contents. 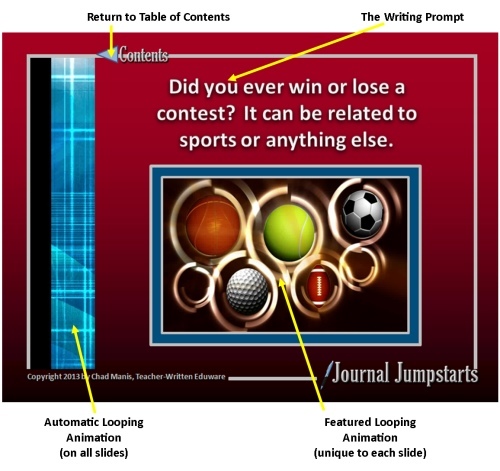 The video capture below shows all five slides available in Jumpstarts, Volume 5, Free Version. This preview is not NEARLY as smooth as the finished version, but it will give you some idea of what to expect. You should see it in person! explore their own thinking, preferences, and attitudes. make suppositions about how they would react in hypothetical situations. think about and analyze events in the past and the present. make predictions about events in the future. 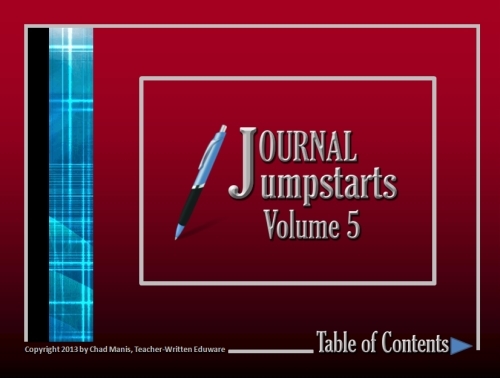 In short, Journal Jumpstarts, Volume 5, provides an intriguing visual way to engage student interest and to invite them to embark upon a journey of self discovery, while honing their writing skills in the process. As noted above, these recently-updated resources are compatible with all versions of PowerPoint. Note: The Free Version contains 3 sample activities, and the paid version has all 20 activities. ALL of the writing prompts included in Journal Jumpstarts, Volume 5, ARE available on the Journal Writing Prompts page, completely free of charge. Rather than the simple listing of prompts that you will find on that page, Journal Jumpstarts Volume 4 takes the student's end-user experience to another level. Besides, why spend all that time writing out each prompt on your whiteboard? Why not show it in PowerPoint via your favorite display mode--the classroom TV, the Smart Board, or digital projector screen? As always, best wishes to you and your kids.